24, 48, 72, 96 or 120 hour services available upon your request. 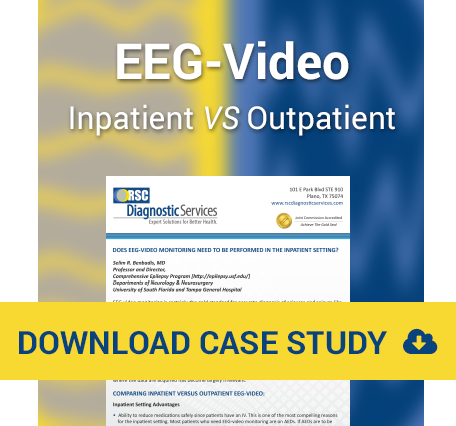 Video or non-video EEG upon your request. Professional and courteous technologists go to the patient’s home for set-up and disconnect. 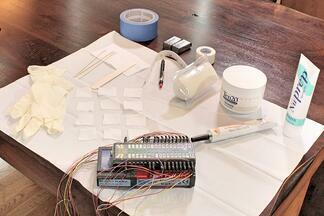 Leads are glued on with collodion making the application sturdier than just gauze and paste. Our system uses a lightweight recording device that the patient can carry either on their shoulder or around their waist. This “headbox” utilizes wireless components allowing them to walk freely anywhere and get rest each evening. Our computer system has high resolution and infrared video that is synced to the EEG. Our system uses batteries that extend beyond 96 hours which eliminates the need for patients to change batteries on a daily basis or replace the memory card. Our qualified technologists verify electrode integrity remotely at least three times per day to eliminate wasted recording time and allowing re-referencing electrodes over the internet. Technical support for the patient. Our technologists will visit the patient at their home to make equipment corrections if needed, eliminating the need for patients to travel to a hospital or lab and reducing wasted recording time. RSC hires only R. EEG T., CLTM to clip and prune all patient EEGs. The proficiency of our scanned studies reduce misreads and overreads and result in quality interpretations of the file. Interpreting and Referring Doctors will have clinical support to answer any questions on accessing studies, scanning studies or troubleshooting. Primary Care Doctors that request In-home Ambulatory Video EEG can use our board-certified doctors to read and interpret the study and provide the referring doctor the interpretation. This allows them to discuss options with their patient eliminating another complete workup by another doctor.